As we sum up the first official week back at work and/or school, the city dealt with some snow and now we’re slated to get hit with some cold from January 11 to 13. 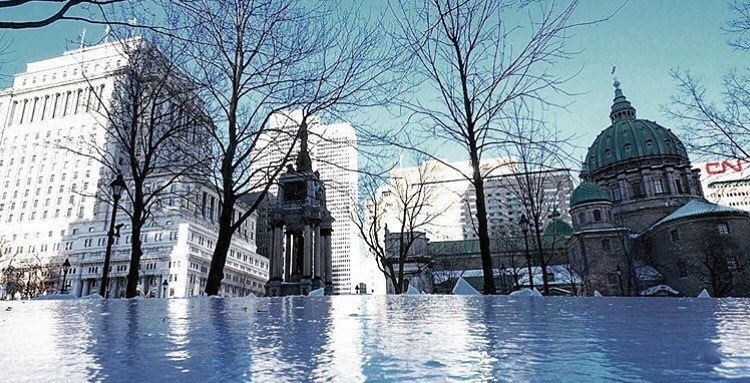 To help balance out the freeze, Montreal is boasting some pretty hot events to check out all weekend. If you’re looking to stay inside or you want to challenge Mother Nature, here are 22 things to check out in the city this weekend. You shall not pass… on this oppurtunity to see 250 musicians on stage performing the epic soundtrack of The Lord of the Rings: Fellowship of the Ring. Experience Howard Shore’s Academy Award®-winning score performed live to the epic motion picture in HD. The musicians on stage from MTL Film Music Orchestra/Choir will transport you to the heart of Middle-Earth in the quest of the Fellowship of the Ring. How about some improv comedy to start off the weekend? The ultimate improv competition in the city is happening on Friday as two teams collide for their weekly, main event. Through a series of match-ups and challenges, all initiated through audience suggestions and interaction, only one team will leave Montreal Improv with the title of champion. Art Loft is one the hottest comedy show in town. 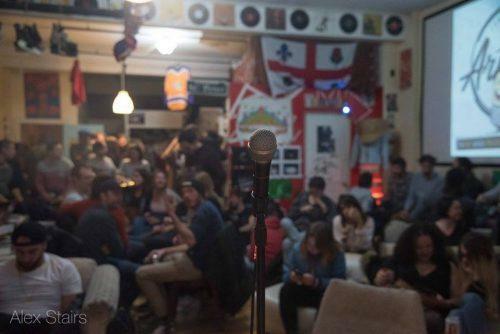 The underground show (and party) takes place at loft apartments and host some of the most talented comedians in town. This week’s show is headlined by Morgan O’Shea, hosted by Quinn McMorrow and features the likes of Jacob Greco, Sin Kara, Coco Belliveau, Pete Makarov, François Touz and Wassim El-Mounzer. The show starts at 9 pm and guests are welcome (and expected) to stay after and party with the crowd and comedians. It’s BYOB and 420 friendly. Very 420 friendly. Just because baseball/softball season is a ways away, doesn’t mean you can’t hone your swing for the 2019 season. Plus, swinging a bat when it’s -20 outside is pretty wild. Coup Sûr has six pitching machines all throwing at various speeds and each machine throws either baseballs or softballs. They have a closed off radar section too if you want to practice pitching. They supply bats and helmets and boast an impressive Baseball Town store if you’re looking for some gear. They offer stellar deals at both the pro shop and the batting cages since it’s low-season. 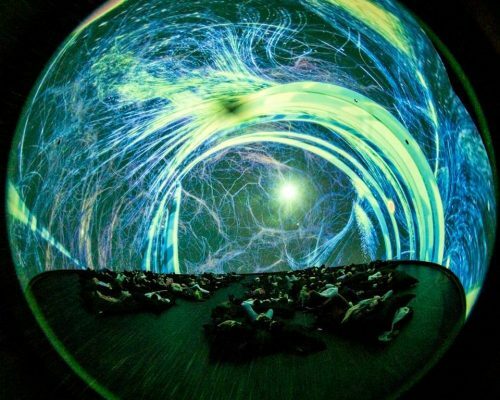 An immersive light, sound and visual art show inside a dome has taken over Montreal’s Society for Arts and Technology (SAT). To use scientific language to describe the event, we’d say it’s totally trippy. Trajectories, positions, distances, scales and speed are all interwoven in a show with music, fusing audiovisual and “infinite tridimensional space” in a complex and dynamic ecosystem. Artists from Japan, Brazil, Bulgaria Australia and Canada will be presenting inside the dome tonight. Escape the cold and try to figure your way out of an escape room. Try your luck at escaping from a prison, a military facility, a lost temple, or a laboratory. Make a reservation, choose your adventure and then you have anywhere from 30 minutes to an hour to get out of any respective room. Each mission is reserved solely for your group and you’re given a walkie-talkie in case you need hints/get scared. Price: $15-$30 depending on your chosen mission (per person). Make your reservation first online. Montreal-based fitness company POP Spirit is hosting a series of outdoor snow yoga sessions this winter. 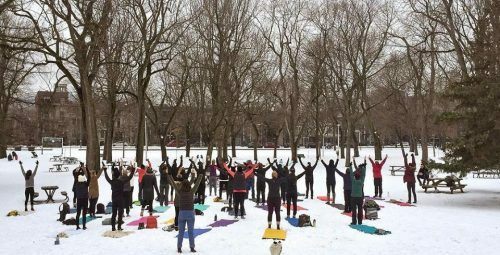 Aptly titled POP Yoga Neige, classes will take place every Saturday and Sunday from January 12 to March 24 at Parc La Fontaine and Parcours Gouin, respectively. All classes are free to the public and boast top-notch, professional instructors. All you have to do is bring your own mat and dress warmly (and we mean, really warm). Fresh off a tilt in St.Louis, the Habs return home on Saturday to face off against the Avalanche at the Bell Centre. This will conclude a pretty busy week for the Canadiens in which they played against Minnesota, Detroit, St.Louis and Colorado. Expect a pretty vibrant atmosphere as Price as the boys take on Nathan MacKinnon and the Avs. 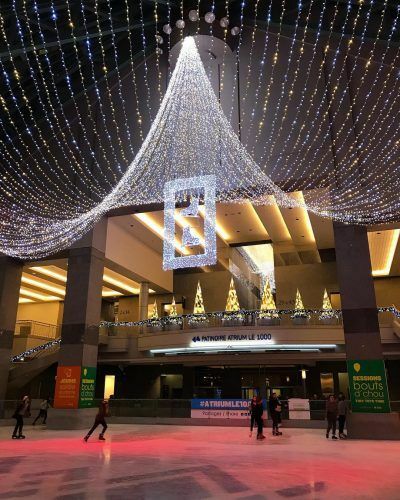 If the weather doesn’t bode well with you this weekend, lace up the skates and glide to the lively beat of music at the Atrium inside one of the tallest buildings in Montreal. The rink is covered under an immense glass dome so you can feel like you’re outside without having to deal with the pesky weather. Plus, it’s gorgeously decorated for the winter season. The emo rockers will be rockin’ out at Place Bell on Saturday. (You don’t actually have to panic). There’s a massive vintage clothing sale happening on Prince-Arthur this weekend, with old-school clothes from the 50s, 60s, 70s, 80s, 90s, and early 2000s up for grabs. The pop-up shop accepts both cash and cards. 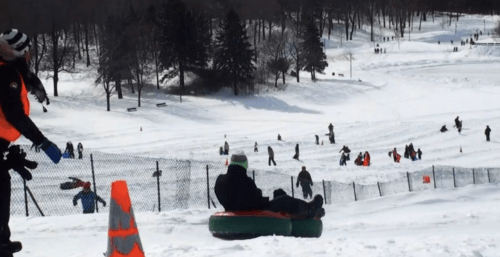 Take advantage of the pride of Montreal by snow tubing down it. Discover the exhilaration of snow tubing down reserved lanes next to the toboggan hill overlooking Beaver Lake. Sneak away from the winter cold and spend a few hours in a warm room while staring at wax celebrity figures. Check out your favourite actors, athletes, and artists in wax form. The figurines are displayed beautifully through the four-floor museum that also features optical illusions and interactive displays. It’s admittedly pretty creepy staring into Elvis’ eyes, especially if he starts blinking. 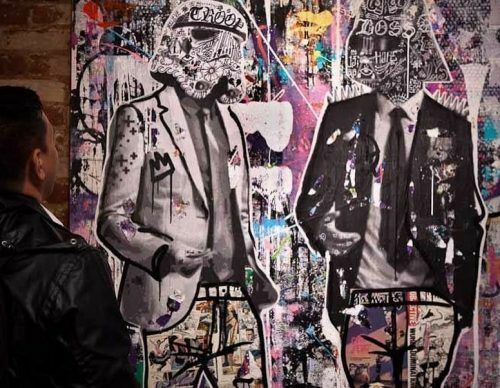 Station 16 Gallery is a contemporary urban art gallery that features an international roster of artists who are influenced primarily by street art and graffiti. The gallery constantly reinvents itself and breathes life into the Montreal art scene, exhibiting works of art that challenge the traditional white cube gallery space. It’ll be toasty alternative to that frigid outdoor temperature. All bets pants are off this weekend as the annual ‘No Pants Subway Ride‘ returns to Montreal for the 2019 edition (except we call it ‘Metro Ride’). Guests are asked to meet at the Sherbrooke Station (with pants) and after passing the turnstiles, ditch the slacks. Take your kids to iSaute Kirkland and pretend it’s for them when it’s really for you. iSaute is a massive venue that has over 30 giant trampolines, trampoline basketball, wall climbing and a trampoline jungle gym. You pay by the hour, there’s a lot to do and it’s actually a fantastic workout. Fun for all ages! 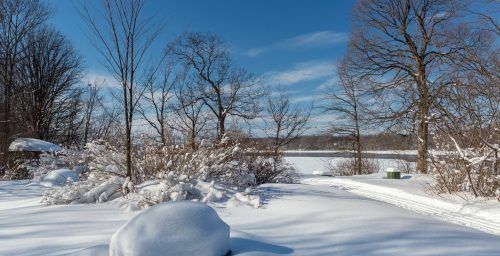 The City of Montreal wants you to see more of this gorgeous province this winter by checking out the city’s biggest national park – for free. So, pack a lunch, hop on a shuttle bus and spend the day in the great Canadian outdoors! Parc-Nature du Cap-Saint-Jacques is offering free shuttle services from downtown Montreal this weekend (and six days afterwards). With 330 hectares of land, the Parc-Nature du Cap-Saint-Jacques is the largest park in Montreal. It’s bordered by Lac des Deux Montagnes and the Rivière des Prairies, offering magnificent views of icy, snowy, land. The park is also boarded by ecological farms that include cows, goats, sheep, donkeys, rabbits, ponies and pigs as well as a rustic sugar shack where guest can enjoy locally produced maple syrup. The Hockey Cup History travelling exhibit opens on Friday at the Dorval Museum of Local History and Heritage. Hockey fans can take a look at trophies, rings, hockey sticks, archival footage and over 50 hockey-related artifacts. Visitors are also invited to play a hockey tabletop game as well as a ‘design your own goalie mask’ workshop. From indoor skating to outdoor, we can’t call ourselves true Canadians without offering both. 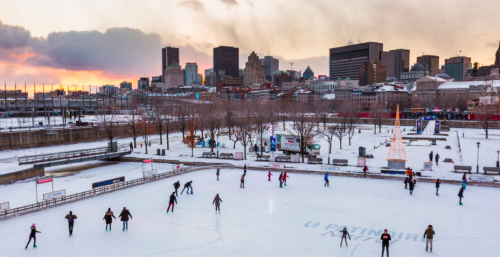 Known for its outstanding quality of ice, excellent facilities, and breathtaking views of the city and the Saint Lawrence River, this is the place to go outdoor skating in Montreal. There’s no better way to stick it to winter than bundling up and hitting the ice. The chilled 2,500-square-metre rink features a cozy village right in front of the ice and is a puck’s throw away from Bistro Bonsecours for a little post-game refresher. Natrel’s Skating Rink plays rock, classical and jazz music on large outdoor speakers to add to your soundtrack of whizzing down the ice. No offence, Mont Tremblant, but we might hit the slopes a bit closer to home this weekend as La Pente à Neige has constructed a man-made ski hill at Parc Ignace-Bourget. 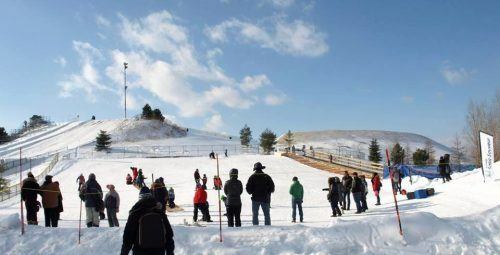 If you’re up to braving the cold, the second edition of the urban hill is big enough for up to 250 people and there’s also a mini slope on site to accommodate up to 50 mini-skiers. The hill welcomes skiers, snowboarders, tubers and sledders of any age and features a cozily heated yurt, mulled wine, hot chocolate and music. Guests can bring their own equipment or it can be rented on site. Place des Festivals has brought Montreal sights and sounds by fusing dominos, music and lights. 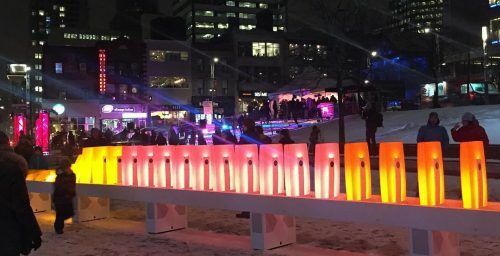 The 9th edition of Luminothérapie, Quebec’s largest temporary public art installation, is called “Effet domino” by Ingrid Ingrid. The installation will feature 120 giant dominos spread out across several different stations. The public is invited to play with them, each creating different music and luminous effects in the process. The dominos are all topple-able as a musical orchestra of dominos illuminate in a rainbow of pastel hues and sounds. Check out some photos here.